Our lab uses biomolecular NMR to probe proteins on an atomic level. Using advanced heteronuclear NMR techniques and 15N/13C/2H enrichment, NMR spectra are collected. Information from these experiments inform on structure, dynamics, as well as protein/protein interactions. 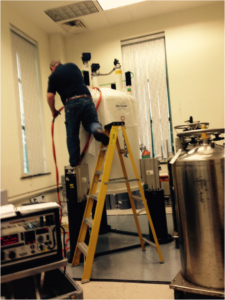 We use magnet facilities at both SU Department of Chemistry (400 MHz) and SUNY-ESF (800 MHz).